FLAAR reviews Hoodman RAW CompactFlash cards for Canon and Nikon digital cameras compared with SanDisk CF cards. In 2014 we continue to use Hoodman memory cards. Hoodman is alive and well at Photokina 2014 with their easy to recognize logo-branded and yellow logo-color hooded booth. The new Hoodman Flash cards, available in SD, Micro SD, from sizes of 8gb to 64gb, at Photokina 2014. In 2014 we continue to use Hoodman memory cards. Taken on Octuber 30, 2014, during a field trip. 4GB Hoodman CompactFlash memory card for Nikon D100, Nikon D200, and Canon EOS 5D SLR digital cameras. We are starting a long-range review of Hoodman 8GB, 4GB, and 2GB Raw CompactFlash Professional cards. We have a Canon EOS 5D, Nikon D300, Nikon D200, Nikon D100, and shortly will have a Nikon D700 available from one of our staff photographers. We already have aPhaseOne P25+ on a Hasselblad V-body to test these Hoodman 8GB, 4GB, and 2GB fast professional compact flash CF cards with. Most of the evaluations will be done over the winter, in Guatemala. At PMA 2006 the nice folks at Hoodman had their booth in a prime location. 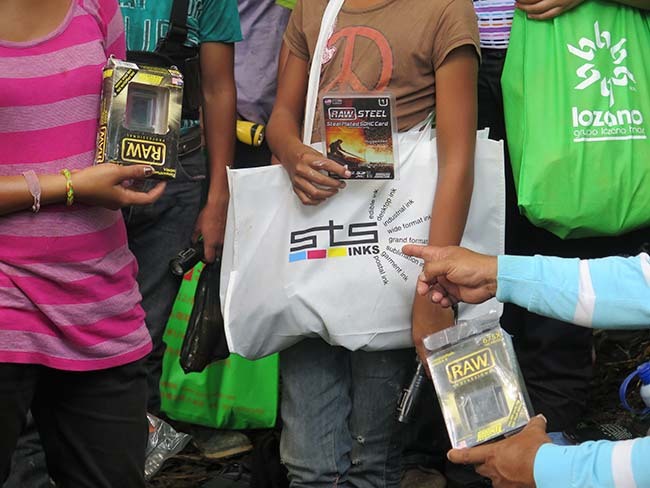 So all their digital camera accessories were very noticeable. Since we are evaluating the Canon EOS 5D camera, we thought it would be a good idea also to test their 4 GB Hoodman Compact Flash memory card. It has the numbers 150X-133X on the card. In the beginning we used the Hoodman 4GB CompactFlash while photographing with the Canon EOS 5D in Greece, Portugal, and London. 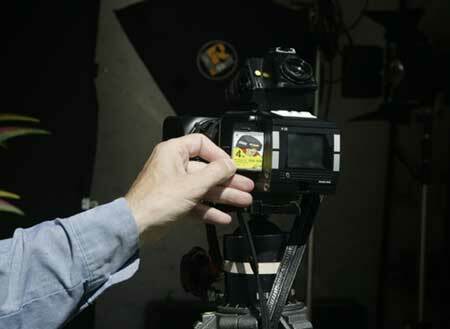 The Hoodman card works just fine, in fact we would consider replacing our Lexarn and SanDisk cards. But since we have about six digital cameras in use, we need six CompactFlash cards. So we continue to use the hodgepodge of various brands that we acquired before we learned about the Hoodman CompactFlash memory cards. 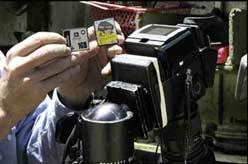 We are wary of IBM and Hitachi hard-disk memory for digital cameras. Our IBM failed; most people who have them say the IBM style are too delicate. We actually had two of them fail. The Hitachi hard-drive memory cards are supposedly much better, but why take the risk. If we get a Hitachi to try out, we will try them, but with the Hoodman Compact Flash memory card we are perfectly content. 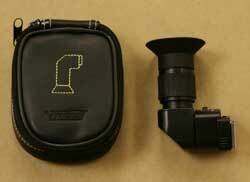 Hoodman also makes many other accessories for digital cameras. 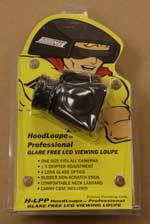 We will try out other Hoodman products as they become available. The 4GB Hoodman CompactFlash definitely helps when you have a 12-megapixel camera such as the Canon EOS 5D. FLAAR has a long-range photography project to create a reference archive of high-quality photographs of the ethno-botany of the Maya of Guatemala and adjacent countries of Mesoamerica. Cacao, vanilla, cashew and many other tropical plants were important in the food resources, iconography, and mythology of the Maya (especially cacao, flor de Mayo, copal, and even the indigenous rubber tree). As do most photographers, we at FLAAR have CompactFlash cards from SanDisk and Lexar (not shown here). 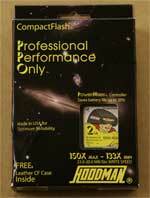 But in 2006 we began to try Hoodman CompactFlash memory cards. We need the larger capacity (such as 8 GB here) because the PhaseOne P30 digital back is a 31 megapixel camera. A 1 GB card lasts less than an hour. So a 4 GB card sure is an asset. By late 2006 we upgraded to a 39-megapixel PhaseOne P45 on a Hasselblad H2. This is where the 8 GB size was crucial in that early year, with the 4 GB card for the Canon EOS 5D. We also have several Nikon digital cameras and a Kodak SLR/n that really work best with a fast card with enough GB to handle the setting that produces RAW+JPEG simultaneously. Plus you need back-up card(s). Of course today (2010) you would need even more memory, such as the 16GB and 32GB CF memory cards. Here is Nicholas at PMA 2006 with Lou Schmidt, Vice President, Marketing. Hoodman USA is a family owned and operated business. I always admire a family that can work together. 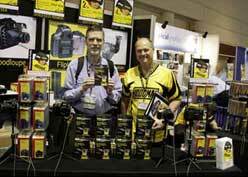 The Hoodman company has grown over the years that we have seen their booth at many photography trade shows. The Schmidt brothers stand behind their product. After evaluating the Phase One P30 we acquired a Phase One P25, to evaluate it. This came with a SanDisk 1GB CF card. Of course 1 GB is not enough for a 22-megapixel digital back. Plus a colleague of ours said that all three of his SanDisk CF cards had problems. Indeed the SanDisk card that came with the Phase One could not be formatted. We tried formatting it on a Mac and PC. Zilch. So instead we used the 4GB CompactFlash card from Hoodman. This card has never failed, and it allows itself to be formatted by all our cameras (Nikon D100, Canon EOS 5D, and medium format digital backs). Over the years we will published the results from this day's photography (heliconia flowers in Guatemala). Today we have newer digital cameras that really need the 32GB RAW CompactFlash cards. Our reports on the Canon EOS-1Ds Mark III will be out before Photokina 2010. We like the 4GB Hoodman CompactFlash card so we acquired a 2 GB Hoodman CompactFlash card as a backup. It has a 150X to 133X factor (23 to 20 MB/second write speed. Very nice. The HoodLoupe is a one-size fits-all-cameras model, that again, we need when out on location photographing miniature orchids in Guatemala, or archaeological artifacts. The right-angle-viewer we saw in Hoodman ads in camera trade magazines. With all the close-up work I do, this accessory is essential. As do most photographers, we at FLAAR have CompactFlash cards from SanDisk and Lexar (not shown here). But recently we began to try Hoodman CompactFlash memory cards. We need the larger capacity (such as 8 GB here) because the PhaseOne P30 digital back is a 31 megapixel camera. A 1 GB card lasts less than an hour. So a 4 GB card sure is an asset. This coming month we will upgrade to a 39-megapixel PhaseOne P45 on a Hasselblad H2. This is where the 8 GB size will be crucial, with the 4 GB card for the Canon EOS 5D. We also have several Nikon digital cameras and a Kodak SLR/n that really work best with a fast card with enough GB to handle the setting that produces RAW+JPEG simultaneously. Plus you need back-up card(s). 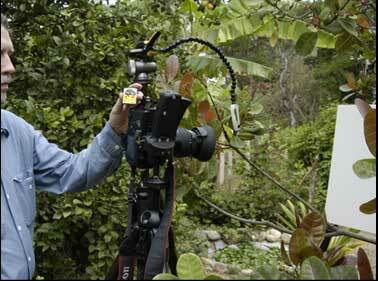 Shortly we will have the results from this day's photography (heliconia flowers in Guatemala). We like the 4GB Hoodman CompactFlash card so we acquired a 2 GB Hoodman CompactFlash card as a backup. It has a 150X to 133X factor (23 to 20 MB/second write speed. Very nice. The HoodLoupe is a one-size fits-all-cameras model, that again, we need when out on location photographing miniature orchids in Guatemala, or archaeological artifacts. Most recently updated September 17, 2014 at Photokina. First posted April 18, 2006. Updated June 19, 2006, July 12, 2006 and September 9, 2010.